George Graham Reviews John Scofield's "Piety Street"
Spirituals, or African American Gospel songs became a significant part of the folk music scene of the 1960s, back before the rise of singer-songwriters, when folksingers did mainly traditional songs. Some of the artists who specialized in the genre had some general commercial success -- people like such as Mahalia Jackson and later, the Staples Singers. Now some 45 years later, it seems that spirituals are experiencing another revival among a newer generation of artists who are rediscovering the stirring old songs. Emerging groups like Ollabelle, and artists Mike Farris, along with veterans like Bruce Springsteen, Michelle Shocked and Susan Werner have done Gospel-influenced albums. As has Liz McComb whose CD we reviewed last year. This time we have a jazz-rock fusion guitarist of considerable note taking a musical ride on the Gospel Train. It's John Scofield, and his new CD is called Piety Street. John Scofield has had an illustrious career in both straight-ahead jazz and in fusion. One of his first recording dates was with Charles Mingus in 1977. He was also part of Miles Davis' band in the 1980s, and has performed with Chet Baker, Gerry Mulligan, Gary Burton, Herbie Hancock and many others. Among his more recent recording projects were a CD with the trio Medesky, Martin and Wood, and an album of his interpretations of songs made famous by Ray Charles. He's a distinctive player with an readily recognizable sound, Scofield's music spans a wide range between rock, funk and jazz. 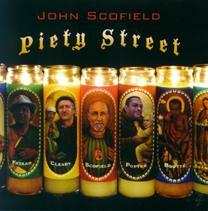 In his liner notes to Piety Street, Scofield said that he originally set out to do a blues album in New Orleans with some Crescent City musicians. He writes "At some point in the planning stages, I began wondering if the world really needed another CD of 12-bar blues tunes." He found himself attracted to old Gospel songs he liked, music he calls "the fraternal twin to R&B." So that became the direction in which he took the recording. His collaborators on the CD very much embraced the music, and include Jon Cleary, who is heard on keyboards and most of the lead vocals, legendary New Orleans bassist George Porter, Jr., and Ricky Fataar on the drums, who has played in Bonnie Raitt's Bump Band. John Boutté is also tapped for some of the lead vocals. It's a generous collection of mostly familiar traditional Gospel songs, many from the African American tradition, arranged in distinctive ways, to take full advantage of the New Orleans environs, running to the city's distinctive flavor of funk and grooves. Scofield plays his guitar, in his style that keeps the familiar beat, but often takes interesting directions, especially in his solos. John Scofield writes in his liner notes that he doesn't embrace any formal religion, but says "who can deny the power of these messages?" His new CD Piety Street is a joyful, but eclectic blend of the sensibility of a very creative jazz guitarist with some great traditional style music as served up by first-rate New Orleans musicians. The result is music you can sing along to, seasoned with a fairly subtle but multifaceted approach converging from different stylistic directions. Piety Street, by the way, is a street in New Orleans and the name of the recording studio where the sessions were done. Our grade for sound quality is about a "B plus." The mix is a bit quirky with exaggerated stereo separation. And the dynamic range, the way the recording reproduces the differences between loud and soft, is somewhat impaired by volume compression. John Scofield has shown a good deal of versatility in his career as a jazz and fusion guitarist. Piety Street is another great example, an album likely to find audiences beyond the jazz and fusion crowd, given the way traditional spirituals are being re-discovered.